Welcome to the newly updated version of Pylon Network’s website! As we had informed you since last Friday, our website has been in edit mode in order to facilitate the changes and the necessary maintenance work for a complete makeover. Today we are happy to present to you our updated website combining a complete modernization of the aesthetics with an update of relevant information regarding the developments of Pylon Network. There is also a little surprise, which we have been preparing for you (read below to find out more!). One of the first things you will notice – besides the updated background with the addicting yellow beams of electrons- is the lighter and cleaner graphics which are now in place. At the top of the page you can find a “one-stop-shop” for all important information regarding Pylon Network: the White Paper, the Blog section, the tutorials regarding Pylon Token and contact information. You can also find our main communication channels for easy access (all channels can be found at the very bottom of the page). However, the real fun starts with scrolling! Klenergy METRON: The cornerstone of Pylon Network deserves a separate section – of course! We have added a link to offer a more detailed description of the capabilities and characteristics of our innovative smart energy meter! Try the DEMO version of Pylon Network: Yes – that’s right! You are now able to test the Alpha version of Pylon Network and see it with your own eyes! Simply register with your email address and you will receive a notification to be the first to access the DEMO – which will come live soon. 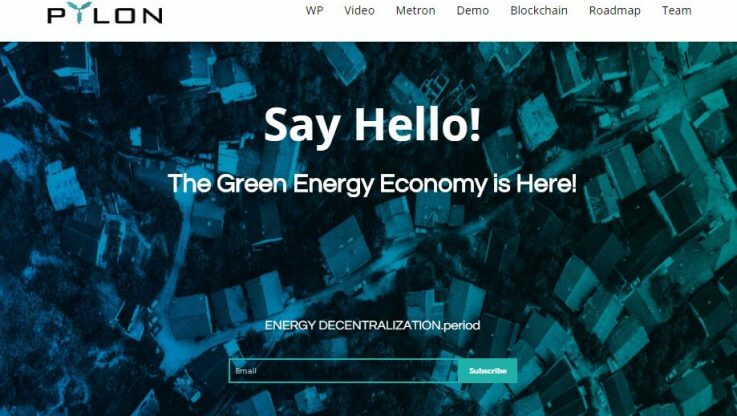 Pylon Network Blockchain: the first open-source blockchain code developed for the energy sector comes with many innovations in order to make Pylon Network a platform capable of accommodating the specific needs of the energy market. Have a look at the technical characteristics of Pylon core – you can click on “more info” to get in a more technical dive in what makes our code innovative and special. PylonToken and PylonCoin: We have been asked many times what is the difference between Pylon Token and Pylon Coin. Find all relevant information and understand how these two crypto-currencies will revolutionize the energy sector. Are you a “prosumer”: We like prosumers! They are the future of our energy future and Pylon Network recognizes this role. In case you are one of them, register your installation in our database and you might be one of the first lucky ones to participate in Pylon Network in the near future! Roadmap: we have updated our roadmap to reflect the recent developments of our project in relation to the achievements of our future milestones. Now, it’s time to dive in and experience all these new and exciting features (and please let us know what you think about it via our communication channels).